His work is not just a fluidly structured dual biography but a provocative history of a turning point in the evolving hotel and restaurant industry. 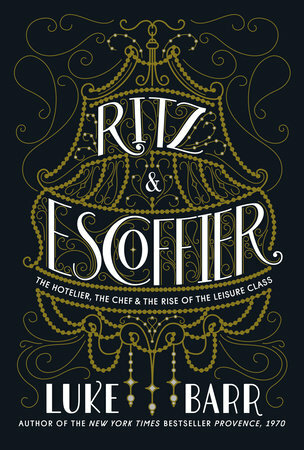 Ritz & Escoffier is a vividly engaging piece of social history about two humbly-born visionaries—one a great hotelier, and one a great chef—and the temples of luxury they fashioned, first at the Savoy Hotel in Belle Époque London, and then at the Paris Ritz. Filled with intriguing details and fascinating (and sometimes unsavory) characters, Ritz & Escoffier re-creates a certain time and place with the deftest of touches. In this winningly told story, Luke Barr explores the advent of the luxe life through the saga of hotelier César Ritz and chef Auguste Escoffier, whose partnership brought us not only the adjective ‘ritzy,’ itself no small testament, but also such once-novel phenomena as hotel rooms with their own bathrooms, and innovative dishes like Peach Melba. It’s a charming tale of success, scandal, and redemption—complete with an unexpected villain. Trigger alert: It will make you hungry, and a little nostalgic for bygone times. A thrilling story of how an outsider—a Swiss peasant—instructed 19th century aristocrats, celebrities, politicians, and plutocrats how to live and, in doing so, single-handedly defined modern luxury. Luke Barr’s incandescent narrative is as smooth and seductive as the service at the Ritz.